Welcome to the webpage of the Laboratory for Endangered Languages Research and Documentation. Work is continuing at the lab on developing online talking dictionaries and archives of data that provide resources to communities whose languages are at stake. With state-of-the-art technology we're striving to support the continuing development and usage of languages in small communities. Some of the talking dictionaries: Tuvan talking dictionary, Siletz talking dictionary, Matukar talking dictionary. 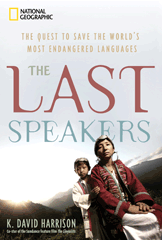 K. David Harrison's book "The Last Speakers" has been published by National Geographic. Get your copy here today. Edited by Endangered Languages lab director K. David Harrison with Wade Davis and Catherine Herbert Howell, "Book of the Peoples of the World: A Guide to Cultures" has been published by National Geographic. Get your copy here. 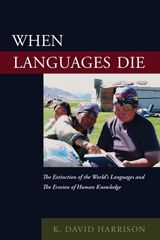 Endangered Languages lab director K. David Harrison's book, "When Languages Die: The Extinction of the World's Languages and the Erosion of Human Knowledge", has been published by Oxford University Press. Get your copy here.